Jurnal Penelitian Sosial dan Ekonomi Kehutanan (JPSEK) is an accredited journal, based on the decree of Ministry of Research, Technology and Higher Education (RISTEKDIKTI) Number 21/E/KPT/2018 with Second Grade (Sinta 2) since years 2016 to 2020. 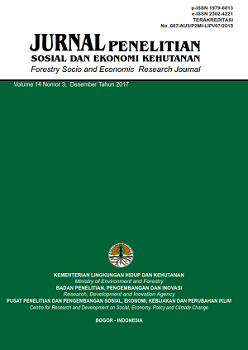 This journal publishes result research in forest socio-economics and environment which cover: socio economics on community, sociology forestry, political and economic on forestry, social studies, environmental policy, forest resource economics, natural resources economics, agricultural economy, ecotourism economy, forest products value chain, social forestry, forestry policy, public policy, ecology and landscape management, conservation of natural resources, land and forest fire, soil and water conservation, agroclimatology and environment, mitigation and adaptation to climate change. First published in 2001, accredited by LIPI in 2006 with number 60/Akred-LIPI/P2MBI/12/2006. JPSEK is published three times annually (April, August and December). 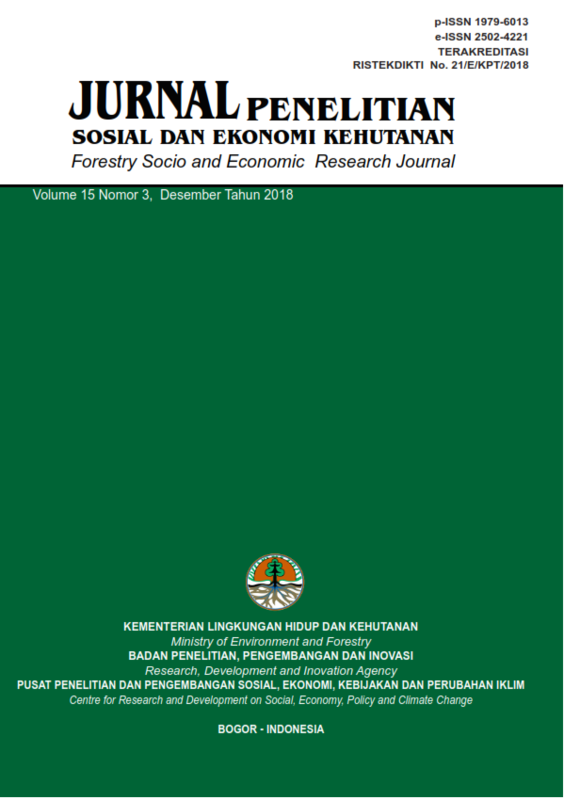 Jurnal Penelitian Sosial dan Ekonomi Kehutanan published by Centre for Research and Development on Social, Economy, Policy and Climate Change; Forestry Research, Development and Innovation Agency; Ministry of Environment and Forestry. The name of the publisher has changed because of the merger of the Ministry of Forestry with the Ministry of Environment, becoming the Ministry of Environment and Forestry, Republic of Indonesia (Presidential Decree No. 16/2015). The publisher logo also changes to adjust the Logo of the Ministry of Environment and Forestry. Jurnal Penelitian Sosial Ekonomi Kehutanan (JPSEK) has defended the accreditation status of the Ministry of Research, Technology and Higher Education (RISTEKDIKTI). The accreditation issued show respect and trust to the management of journals upholding the dignity of researchers in Indonesia.